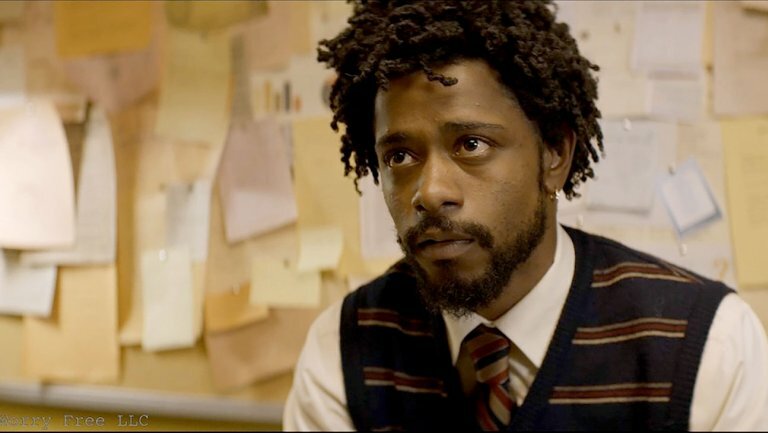 Sorry to Bother You signals a new voice in American comedy and comedy in general. Where European filmmakers like Maren Ade and Ruben Ostlund have put their spin on the genre, twenty first century American comedies have stagnated in pursuit of lazy naturalistic improv and adults who behave like children. This tendency has seeped into British culture as well. It is hard to think of a single American comedy of recent years that has any visual style to speak of, but Boots Riley goes back to the roots of silent comedy with big set pieces, visual gags, and characters who have interesting faces and style. Unlike the majority of modern American comedies, Sorry to Bother You has a point. It’s angry. The title is ironic but… when the point gets more serious the film seems to apologise by trying too hard to be entertaining and crazy. Cassius gets a promotion to Power Caller, which means for a hefty wage he sells arms over the phone to foreign governments with bad intentions. Some of the jokes here are too heavy to be jokes, so they shouldn’t be jokes at all. Then the Armie Hammer horse thing happens, and either you’re with it or you aren’t. My sense is that Riley isn’t interested in the opinions of people who are offended by this, and he shouldn’t be. This is a new kind of comedy, so people who are used to the old kind will inevitably feel alienated and left behind. The grotesque becomes the beautiful and what we consider beautiful in capitalism - money, television, high-powered jobs - becomes grotesque. The conventional moments stick out more than the insane ones. Like most good comedies, though, the character work is the baseline and Jermaine Fowler, as annoying but goodhearted best friend, Salvador, and Steven Yeun as laidback labor organiser, Squeeze, create a realistic atmosphere amongst the chaos. Sorry to Bother You is fresh but still has its forebears. An American film from 1989 called Chameleon Street by Wendell B. Harris Jr. has the same disregard for good taste and genre expectations, as well as finding absurdity in the experience of being black in America, and sadness. Almost thirty years later, hopefully Harris’ new ground gets broken further by filmmakers like Riley and what grows out of it will be dazzling.